Welcome to Day Two of Reverse Confetti's Countdown to Confetti. 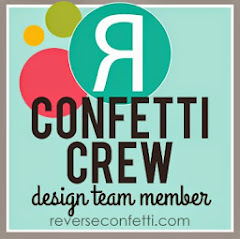 Be sure to visit the Reverse Confetti blog for links to all the designers posting today, as well as details on how you can win a $15 Reverse Confetti gift certificate. 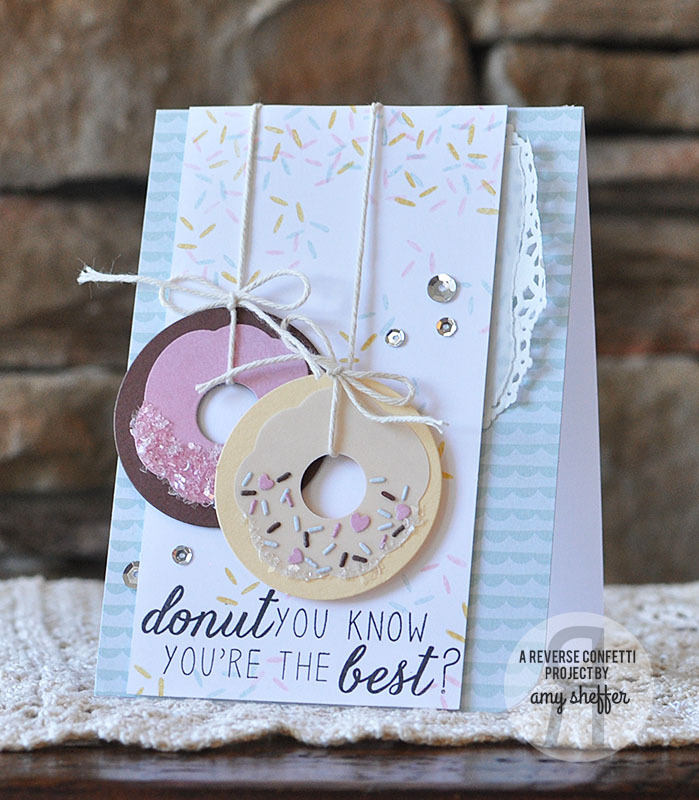 Today the Confetti Crew is featuring the DONUT YOU KNOW stamp set and the corresponding DONUT YOU KNOW Confetti Cuts die set. This set and die combo are so much fun! My chocolate donut is topped with pink frosting and some chunky glitter sugar crystals. My other donut is glazed with vellum and topped with sprinkles and more sugar. In the background is a cascade of stamped sprinkles. 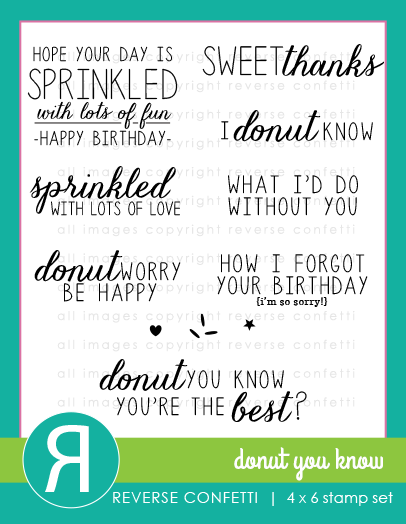 Yep, take your pick, sprinkle with die-cuts or stamp your sprinkles (or both)! Don't forget to check out what the rest of the Confetti Crew has done with DONUT YOU KNOW. 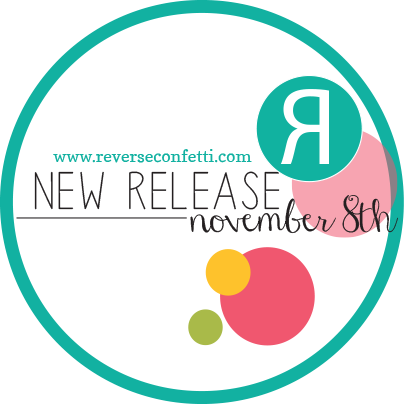 Links are on the Reverse Confetti blog. Thanks for stopping by! Enjoy the rest of the peeks! I love the glitter on these and how you hung them. This is adorable!! cute! like the hanging donuts. 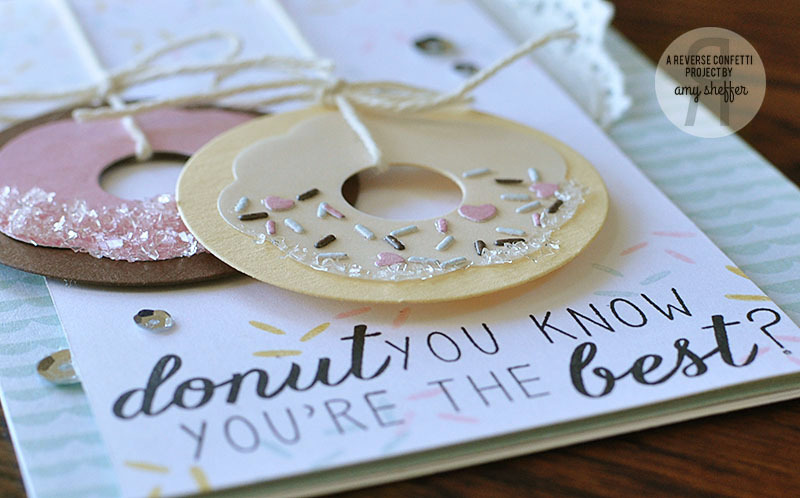 gorgeous cards and those donuts are simply yummy! So much fun to decorate---I just love your donuts! Such a cute card! All these sentiments are perfect too! Loving your dipped doughnuts - YUMMY! I love how you hung the donuts like ornaments! Super sweet! I'm really liking this set, the sprinkles are awesome! Lovely card! The sentiments are absolutely adorable. CUTE! Love how you've decorated the donuts!!! Love the card!! Love the new sets! 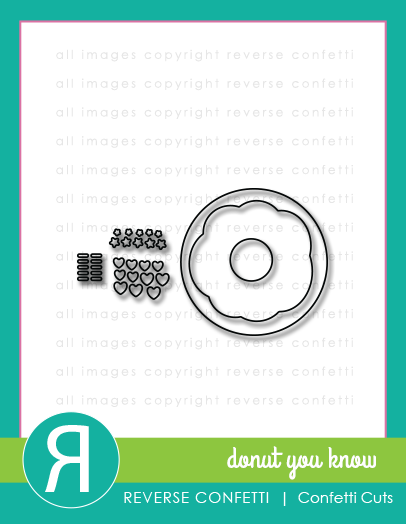 Great card... love the hanging donuts! Looking forward to the release. Love the hanging donuts! Great card! ADORABLE - and I love the sprinkles too! oh, yum! this card is soooo totally sweet. love the glittery, sugary accents you added. Love the vellum glaze - too cute! How fun. Love the card. in the stamp set until I saw your card. I'm thinking how did she do that. Then, I went back and looked at the graphic of the stamp and there it was. So clever and a great way to customize the paper. Another of your adorable cards, Amy. Donuts on a string, very fun, and the sugar sparkles are so fun. That is very pretty! what a different take on the die! Love how you've hung the donuts and love the sparkle on the one! Hey Amy!! I love how your donuts hang from a string!!! They are so cute. Nicely done. The more I look at your card, the more I want to go get a donut and some coffee to go with it. Your card looks yummy. Very cute with the hanging donuts! This is so awesome. Love those hanging donuts! 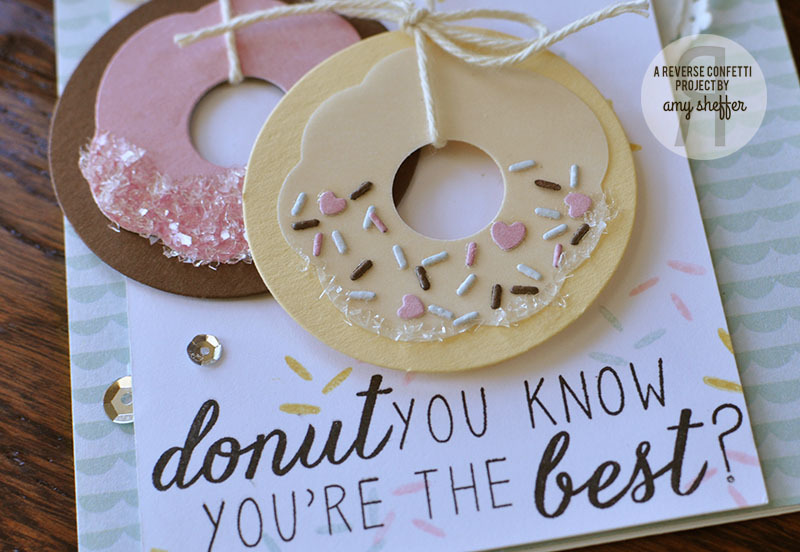 LOVE your dangling donuts, "frosting" & sprinkles too - SUCH FUN stamps & dies ... DONUT know what I will do without them!!! How adorable...love the sparkle and the twine! Oh my gosh so cute! This makes me think of the Halloween activity to try to eat a donut off the string! So cute with those sprinkles. This is a super cute card! I love the donuts! Taylored Expressions Blog Team - Happy News! 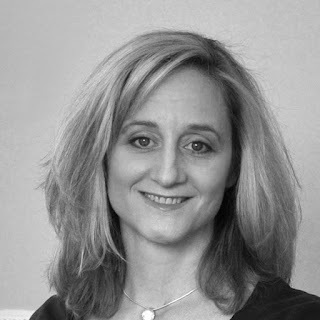 All content, including photographs, text, and design work, is © Amy Sheffer. My original artwork is for personal inspiration only. Please do not copy for the purpose of publication, contest submissions, or profit without written consent. Stamps and other products shown on this blog may have been donated for promotional purposes by the company or companies named in the post.